You can find the entire Bellingham Bucket List on bellingFAM. 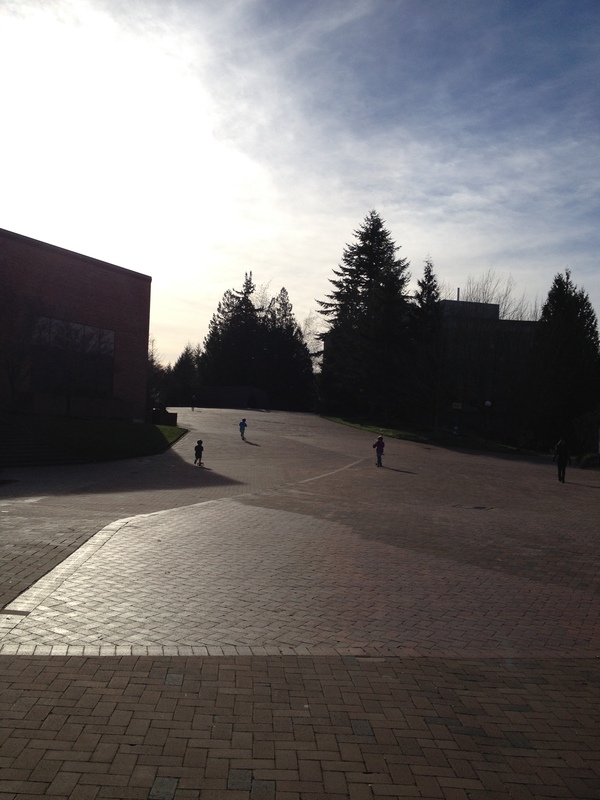 One of our favorite outdoor spaces to explore in Bellingham is the Western Washington University campus. 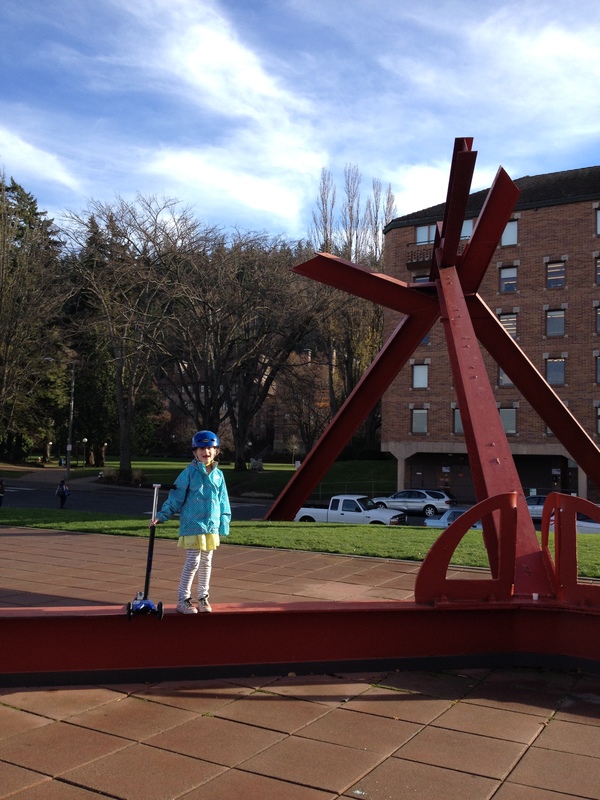 Best for weekend adventures or during campus breaks, when there are fewer students around, the highlight is their awesome interactive outdoor art sculptures that you can climb on, climb up, scooter through, hunt for and play hide-and-seek in. There are nearly 30 sculptures on campus, some are obvious and some aren’t, and I’m pretty sure that even with all of our exploring, we’ve only seen half of them. Some of our favorites are the Stadium Piece, which looks like a huge staircase, the Stone Enclosure/Rock Rings and the Steam Work for Bellingham (all pictured here). It can be surprisingly windy on campus, even on a sunny day, so be sure to take a layer or two more than you think you’ll need. 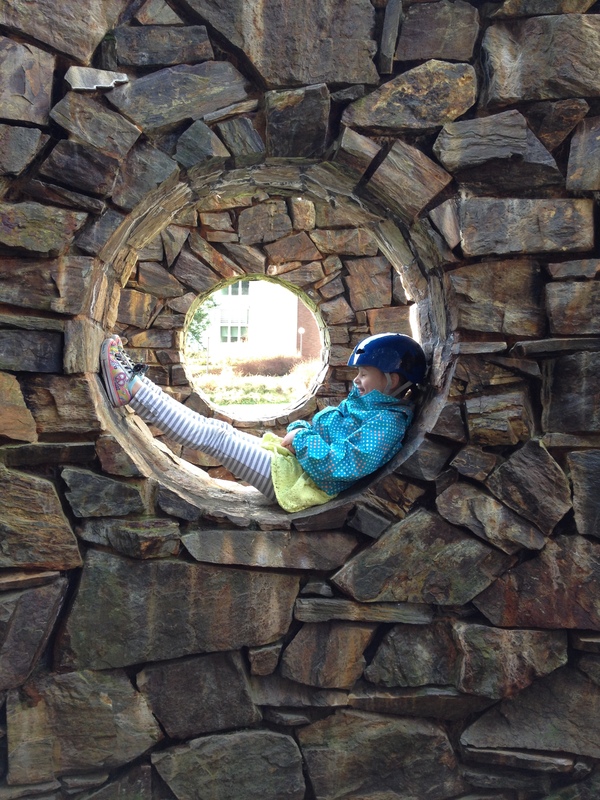 If you have little ones, bring a stroller — the campus is sprawling and with so many cool sculptures to explore, from one end to the other, you’ll be on your feet a lot. If you visit during the weekend, don’t hesitate to bring scooters or bikes (and helmets!). The campus is wheel-friendly, especially when there are fewer students around. If the weather is calm, it wouldn’t hurt to bring along a Frisbee for the big, open grassy areas on campus (just stay off of their pretty sports fields!). As always, throw a few snacks and some water in your bag — you’re guaranteed to have some hungry kids by the time you leave! You shouldn’t need anything else to entertain your kids when you’re on campus, so leave anything extra at home. 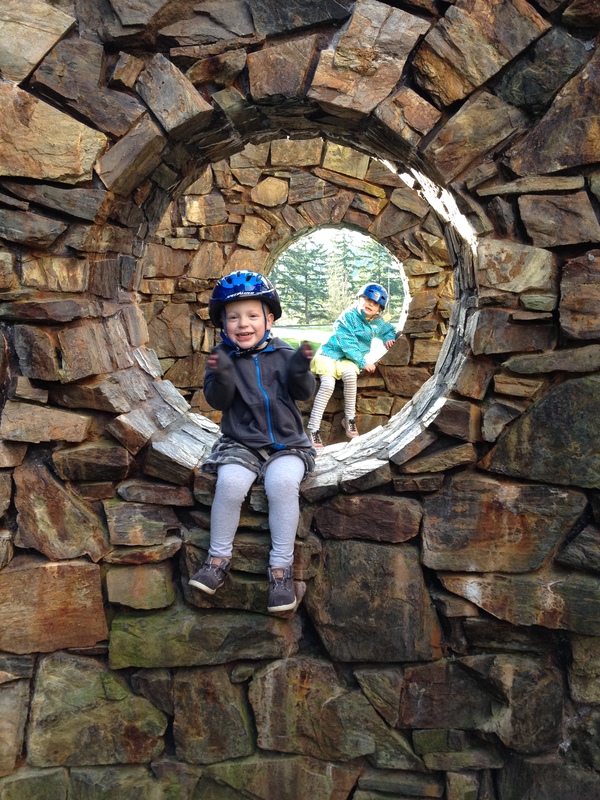 You’ll need all of the hands you can get to help your kids climb and explore the art and sculptures. If you can, leave your purse at home (rather than in the car) or bring one that’s easy to carry. There are a few places to grab a quick bite to eat on campus, if you end up needing more than just a snack. Head to Viking Union for the best options that are also open on the weekends. We’d recommend brown bagging it, as your first option, since there are so many pretty outdoor spots to pull up a patch of grass to eat. Be aware that there are often events happening on campus during the weekends, including sports events, prospective student tours and even the impromptu music video shoot. Make sure you and your kiddos are respectful of campus activities, students, faculty and staff. Guess what? Parking is FREE on campus on the weekends… in some lots. We suggest the big gravel lots on the south end of campus. They are easy to find (directions below) and there are always plenty of spots to choose from. Reminder: Be sure to lock your car doors and leave all valuables at home. From I-5, northbound or southbound, take Exit 252 onto Samish Way. Turn left onto Bill McDonald Parkway and continue up the hill towards campus. Take a right at the stoplight onto South College Drive. The gravel parking lots are on both sides of the street, past the sports fields. After you’ve parked, walk across the street towards the flagpoles to start exploring. 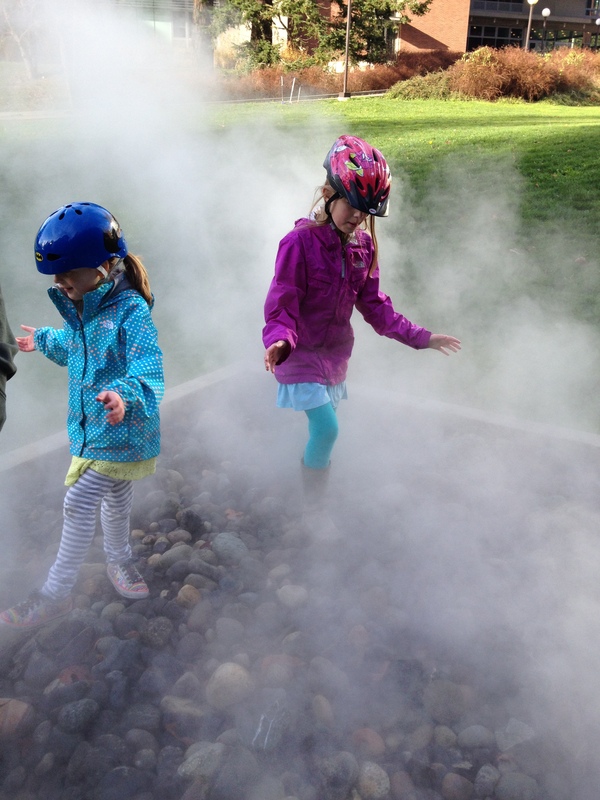 You can find detailed information about the WWU Outdoor Sculpture Collection online, as well as a map of campus that includes all of the outdoor art. You can find general details about Western and the campus on the WWU website. You can also follow Western Washington University’s official Instagram account and Facebook page. 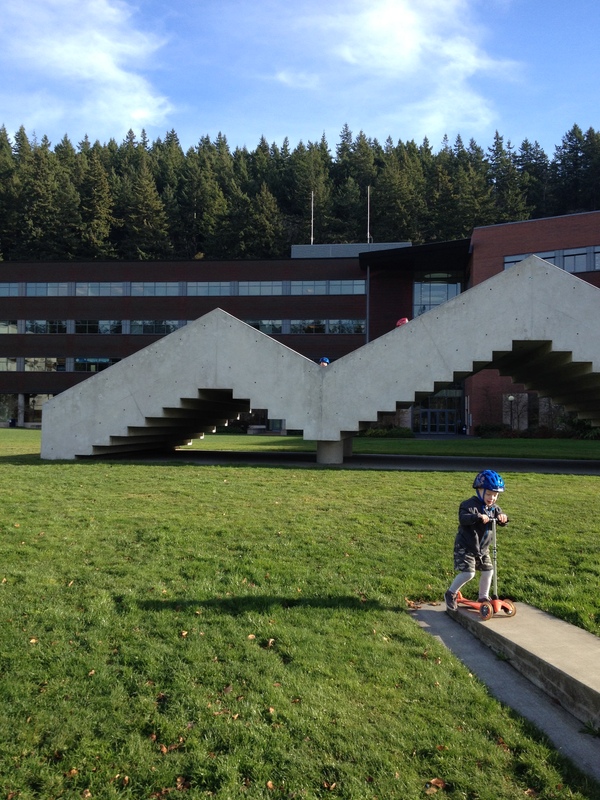 Do you take your kids up to the Western campus to play? What is their favorite spot to explore? 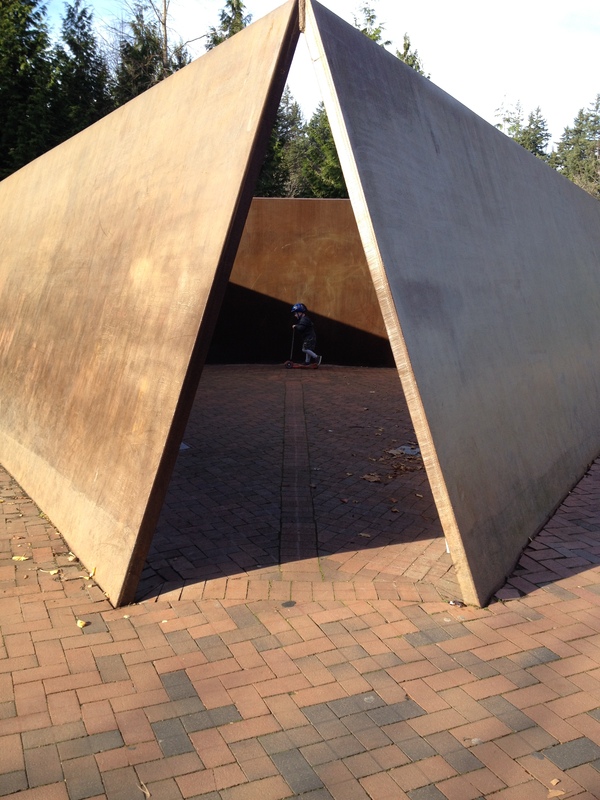 This entry was posted in Bellingham Bucket List, Outdoor Fun and tagged 2014, Art, Bellingham Bucket List, Outdoor Fun, Western Washington University, WWU on March 19, 2014 by Katie Kavulla.